All this talk about food in the last few articles got me thinking. 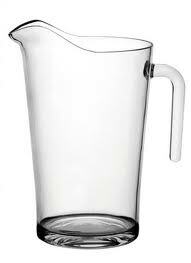 What about nice glassware for your perfectly prepared meals? Look, I know a red Solo cup works just fine, but what about special occasions? What about making things more "home-like?" You could haul around a bunch of fragile glasses, but I've found a much better solution. Essentially unbreakable stem-ware. 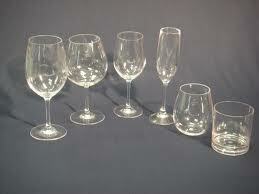 And you can find "regular" glasses and other items too. I've seen these popping up more and more at large department stores all over the place. Amazing as this sounds, there is a substance on this planet that one can make perfectly clear, substantial liquid containers out of that really mimics glass quite well. No, it isn't real glass. It's a polymer called poly-carbonate. This stuff is used all over the place. Even as windscreens on supersonic fighters! Hmmm, how about an RV windshield? It's stands up to reasonably high temperatures and really does feel a lot like glass. They are available in all sorts of sizes and colors too. Even coffee mugs! I like the clear ones. They really are quite amazing. All sorts of different styles can be had. Wine, Champagne, Beer, Hi-Ball, Drinking, Pilsner, even pitchers. You name it, I've found them for sale. They even make fully insulated versions. With an air pocket between an inner and outer wall, you don't get that annoying condensation on the outside of the glass and your drink stays cool or hot longer. What about cost? Aye, there's the rub. Most come in sets of 4 or 6 and cost between $24 and $36 a set. That's about 6 dollars a glass! the insulated versions are even more expensive! If you look around you can get them cheaper, and they often end up at liquidation stores so keep your eyes open when wandering those aisles. I've found several styles for 3 dollars a piece. mostly for 10 oz tumblers and some wine glasses. Try looking for catering supply places online. 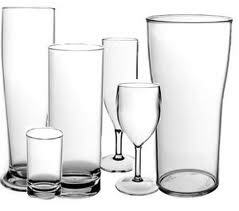 I have a set of 4 wine glasses and 2 champagne glasses as well as 6 drinking glasses and two large glasses that I use for iced tea. They have held up VERY well this season and believe me, I've dropped them more than once. I've noticed no odd flavors and they haven't discolored at all. My old plastic tumblers didn't do nearly as well. Besides, they were ugly! Add some elegance and a sense of home with these beautiful accessories. Next time you're out RV'ing, celebrate! I know I will! Well, you are buying stuff made out of Lexan, after all :p, same stuff used for blast shields on Mythbusters :p.
I'm a big fan of Mythbusters! You are absolutely correct! The newer stuff is better, and actually from what I've seen look more "glass-like."